Have you ever downloaded a file online that is a podcast but it goes into the “Music” section in iTunes? It is definitely a pain to deal with, especially when you browse through your podcasts and can’t find the file. Luckily, there is a simple way to fix this, so you don’t break your Mac. First, launch iTunes. 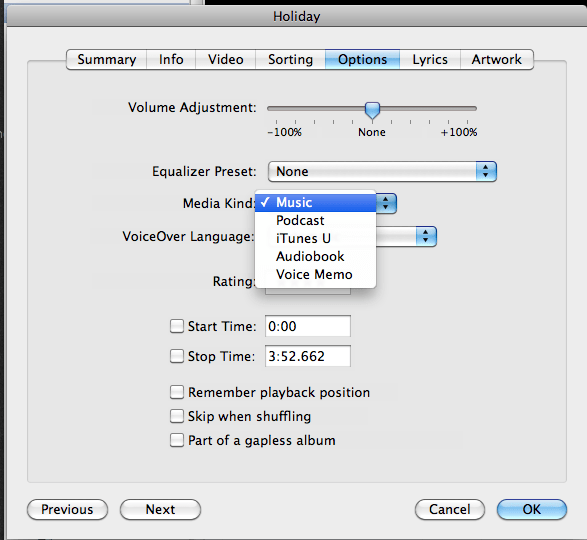 Then choose the file or files in some cases that you would like to change to a Podcast. Next, right click and press “Get Info” or simply use the following key commands Command + i. Next, press the “Option” tab on the top. Then look for media kind and press the drop down button next to it. Then select Podcast, AudioBook, or whatever you want to change the media kind to be.